Kenny's Pictures becomes... Kenny's Holograms? Inside the NBA is the best studio show in sports and has been for many years now. We all know this. But even after all these years, the Turner crew still leads the way in new ways to entertain basketball fans and the 2018 postseason is no different. 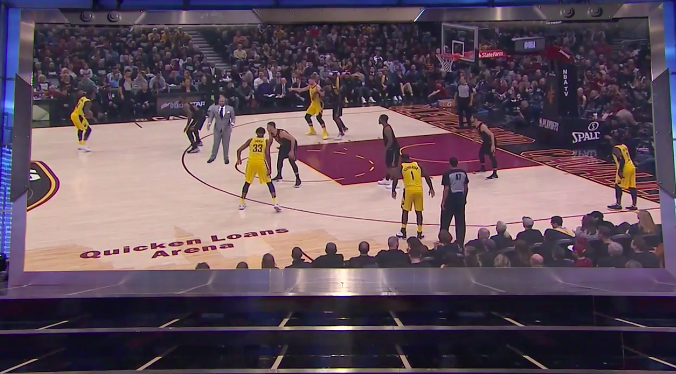 One of Inside the NBA’s go-to segments is Kenny’s Pictures, where analyst Kenny Smith breaks down some X’s and O’s on a supersized screen at the back of the TNT studio. During tonight’s Game 2 coverage of Cavaliers-Pacers, Smith started acting like there were technical difficulties with the screen. After walking back behind the gimmicked screen, Smith actually appeared on the screen breaking down the play himself in the middle of the action. We’ve pretty much seen it all when it comes to televised sports technology, but even in 2018 this was still a cool moment that surprised us. Viewers on Twitter were pretty impressed with the sudden transformation as well. At least it went over better than that weird CNN hologram thing all those years ago. How is twitter not freaking out over what TNT and Kenny Smith just did?!? That was amazing. Seriously… how did he do that? Where is Breaking the Magician’s Code when you really need them? TNT is definitely going to have to use this technology with Charles Barkley and Shaquille O’Neal in the future. How good would a special Shaqtin’ A Fool be with JaVale McGee and Hologram Shaq?